*Offer is $45 off normal eye exam price. To make an appointment, call 570.704.3993 or use the form below. 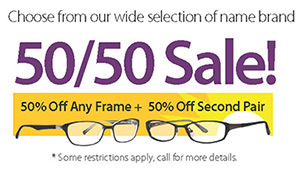 50% off any frame plus 50% off second pair. Choose from our wide selection of name brand and designer frames include AirLock, Calvin Klein, Diane von Furstenburg, Dragon, Flexon, Lacoste, Liberty Sport, Nautica, Nike, Nine West, Oakley, Ray Ban, Salvatore Ferragamo, Spy, Valentino, Vera Wang and X-Games. *some restrictions apply, call for details.